In spite of Lily Allen rising out of the floor to perform "Not Fair," Freja Beha and Lara Stone rolling around in the hay, and the overall country bumpkin look, the most memorable part of Karl Lagerfeld's spring 2010 show for Chanel was actually the footwear. While the classic interlocking Chanel C's have adorned everything from ballet flats to moon boots, never before had they decorated clogs. Well, until now. Clogs have always been divisive shoes--some look at them as comfortable and classic while others view them as the provenance of highly unfashionable hippies or the orthopedically challenged--but I have always been a fan, and thus I couldn't wait to get my feet into a pair, now that, at least in some circles, they're socially acceptable again. 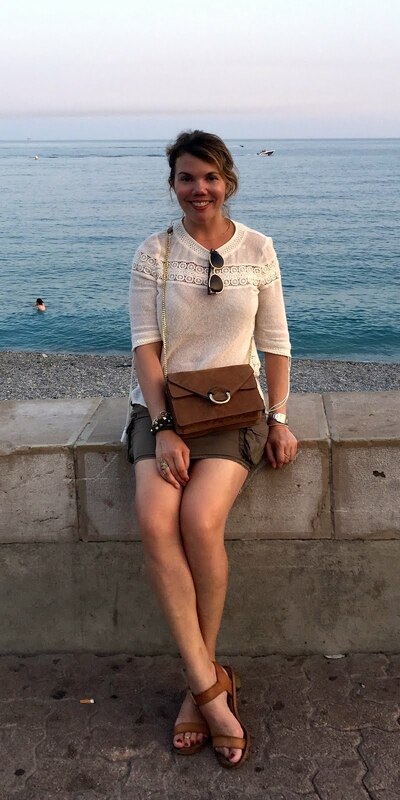 And it should be noted: In spite of the height of all the styles I'm featuring, clogs are quite comfortable and provide good arch support (although not, as my doctor pointed out, good shock absorption). Miu Miu's cat prints have been getting lots of attention this spring, but I like their dove prints even better (then again, I am not a cat person). These satin clogs are the kind of quirky accessory that really makes your outfit, and both the fabric and the gold studs make them a little more stylish and fancy than your average clog. 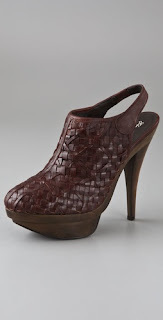 In comparison to the average clog, these Elizabeth and James Greta pumps are downright sleek, with their tapered heel and woven design. 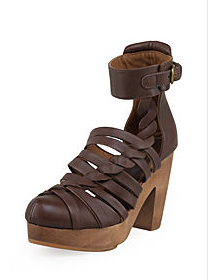 Design tweaks aside, these do qualify as clogs and are thus a great option for those concerned about the frumpy factor. Another designer who does great themes-and-variations on the clog is Rachel Comey, who's known for her indie-librarian aesthetic. 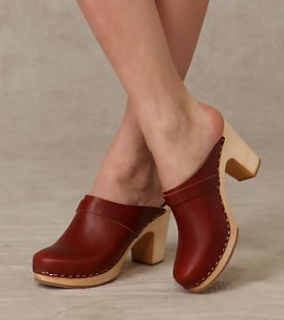 These Badger ankle-wrap clogs are not such a strict interpretation of the trend, yet they have a pleasingly clunky sole that's guaranteed to look great strolling down 5th Avenue (that's in Park Slope, not Manhattan). 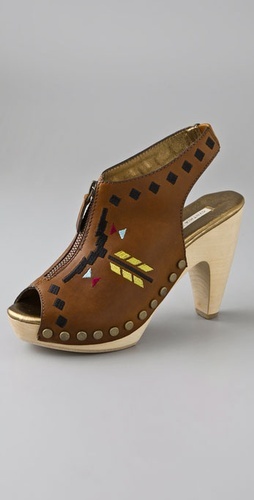 Another rather loose interpretation of the trend is Twelfth St. by Cynthia Vincent's Tamara clogs, which look a little Native American–goes-downtown. Personally, I would find these more difficult to wear than more literal clogs, but these are fun, and isn't that what fashion is really all about? A little more basic is this studded clog from Stuart Weitzman, a reliable resource for well-made, trend-conscious, but not-too-crazy shoes. 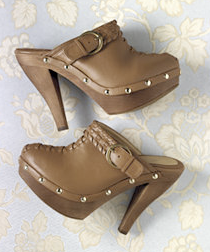 The peep toe makes them a bit more springy, and the scallop detailing adds a little interest. Of course, if you're a traditionalist, you could go straight to the source, and that is Swedish Hasbeens. I know several ladies (yes, all Brooklyn residents) who swear by these--they are both incredibly sturdy and, in their own way, chic. This is their most basic style, with enough of a heel to give your legs a little shape (although it's not nearly as high as the other mega-platform styles I'm showing here). If neither real wood nor real leather matters that much to you, bargains can be had, such as this $29 platform clog from Newport News. I would worry about the foot-sweat factor with this pair, but if you're not sure the clog trend is for you, this is an inexpensive way to try it out. 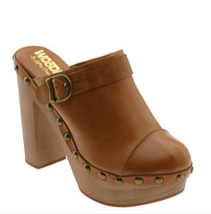 In suede with a wooden sole and stud details, Steven by Steve Madden's Barc clog is a chic option at a reasonable price. The dusty shade of the suede is a bit more stylish than the typical tan or brown color. 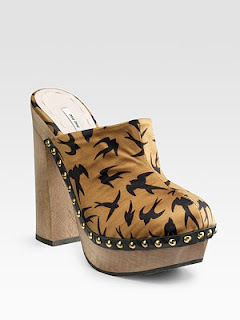 The style I ended up ordering--and the closest to the look of Chanel's clogs, in my opinion--is Jeffrey Campbell's Charli Clogs. The strap can be worn across the instep or in back of the heel, and in spite of the 5-inch heel, these are really quite comfortable (thanks to a nearly 2-inch platform). I got yelled at by my doctor (again, the lack of proper shock absorption), but wearing them makes my feet quite happy.